behind the scenes at Vogue: it doesn't really matter what you've imagined it to be, it only matters what it really is like in Anna Wintour's world. and believe me, it is her world, indeed. and apparently, grace coddington and the rest of us just live in it. fortunately, for grace, her more than 20 yrs of experience have garnered her a tremendous backbone. as privileged as sitting in the front row of a fashion show where wintour runs the catwalk--everything from changing sienna miller's hair and throwing away $50,000 worth of couture 1920s shoots, to loving feathers and fur and hoping to continue her Vogue legacy with her daughter at the reigns. much like any other office, the Vogue house is rife with staff who truly love their job, ones who truly love the idea of their jobs, and ones who just love to pretend--truly. i thought one great moment in the movie is when wintour talks about her siblings and how they are successful working in positions that have nothing to do with fashion. it seems like it is to be believed that she feels ashamed or they are shameful of her for being in fashion. but that could all be close-up camera shots and somber background music. in a way, you can say that any job not in the medical field or that actively saves lives is somewhat fruitless for mankind. but people can find hope and fun and complete happiness in listening to the music by their favorite band, being swept away in a wonderful film, or getting inspired by the pages in a magazine. such is life. and people should do what makes them happy because that will contribute to society more than one would expect. so although this movie has already come out (and this post may seem trite to some), i'm just now getting around to it so whatever. I havent even had the chance to watch this moive in full, only caught the ending. But I totally agree with you! Every profession does benefit people in different ways regardless of what sort of career or job you have, as in a fashion magazine it might not be a Politic/Goverment related job but there are people who base their lives on their favourite magazine and relie on it for advice and guidence. Love your blog... great issus to discuss! i have actually wondered that sometimes... why am i so into fashion, when i could be doing something else... why do i spend my money in clothes and accesories, when i could be giving it to charity? but i think fashion and styling it's more than just pretty clothes, it's art. because it's a way of expressing yourself... and not even conciously. it's funny the number of things you can tell by watching someone's personal style. Anyways... life would be just boring if averybody did the same thing, and there are always chances in life to look after the rest of the world. I love fashion, cause it's fun. Lovely post darling... thank for stopping by my blog. i love what you write, its so inspireing... i'm following you for sure! kisses. hey. i haven't watch this documentary so, i find this review really helps! interesting one. wintour lives in such an awesome world. i think every careers are special. people will succeed their own ways. 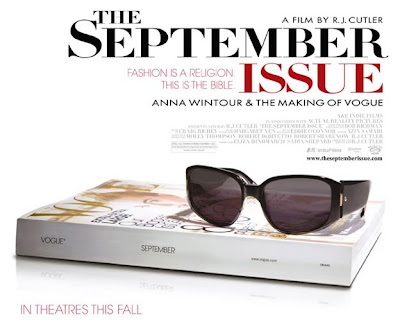 I really like the movie during watching it I discovered Anna Wintour is a very solemn and put-together person though I think deep-down there is something very interesting there that no one has uncovered yet. I haven't seen this film, but it is definately on my to do list!! I loved this documentary. The reason I read American Vogue is because it’s like looking into a portal of a fantasy world and this movie felt the same. Totally insane but in a good way. I have to say, strangely, Wintour thawed me by this! I have never understood her exalted position and as much as I adore fashion, I am not a fan of this fickle world. I do however, know the power of self expression and how we perceive ourselves and others and how we choose to express ourselves. Our choice of clothing, our individual style is an expression of personality, it's an outward manifestation -or mask- of our psyche, our moods, our confidence or even lack of, so I too am a but tired of the "frivolous" tag. I agree with Wintour's decisiveness and her method, if not her 'power', the insular world that gives her this power & her whim wielding ($50k shoot shot to pieces...sheez!). I found it funny too how she played us...she gave good face and in the end, went with Grace...! Unfortunately I seem to be the only who finds Grace to be bit away with the fairies.